I said it time and time again, I love Swedish companies. There is something so innovative about every single product coming out of Sweden it's just unbelievable. 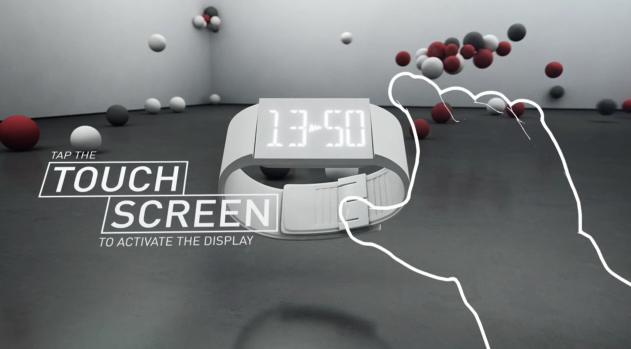 The Swedish watch brand, Mutewatch, has created the most amazing touch screen watch you've ever seen. It's the geekiest watch ever made. Forget the iWatch iPod nano 6G basicness, the Mutewatch come to us straight from the future and features a vibration alarm clock that will vibrate depending on your preference without making a noise and alarming others. Brilliant isn't it? That's not all, the Mutewatch is designed to display the capacitive touch screen display when you touch the flat surface which then lights up the glowing touch screen that displays the time to you using a white LED surface. To change and set up an alarm or the time itself, you simply swipe, pinch and tap. The Mutewatch also has a built-in motion sensor that will turn on the glowing display with just a flick of the wrist and it will also sense your sleeping so that it can increase the level of vibration if you set an alarm. The Mutewatch is available to order right now in white, red and gray for $249, and it will start shipping in July. Check out the video after the break.